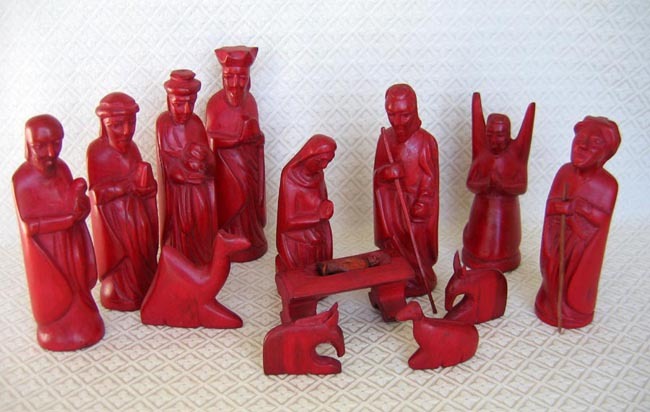 This Nativity set is carved from hardwood by Isaac Hamisi Mwenda. The set contains four wise men instead of the traditional three; many of Isaac’s sets contain four wise men. The set includes 13 figures: Joseph holding a staff, Mary kneeling, baby Jesus in a manger, an angel, a shepherd with staff, a camel, two donkeys, a sheep, and four wise men. Isaac finished this set with many coats of deep red shoe polish to give the figures their burgundy color and shine. Joseph measures 8.25 inches tall. Isaac does woodcarving to support his family in Mombasa, Kenya. In addition to Nativity sets, he carves other items such as animals, bowls, plaques, letter openers, and key chains.